Beach Lane Books, 9781481431569, 40pp. Lauren Stringer celebrates the coming of autumn in this exuberant, joyful ode to that magical time when the leaves are changing color and the animals are preparing for winter. Children and animals alike excitedly anticipate yellow time, when the trees release their colorful leaves to blanket the earth, crows raise their voices joyfully from the bare branches, and squirrels busy themselves preparing their nests for winter. This lyrical celebration of the beauty and fun of autumn is sure to become a perennial fall favorite. Stringer re-creates those last days of autumn when the trees are no longer putting on a fiery show of colors and the leaves are one gusty day away from shuddering to the ground. Short, declarative, yet lyrical sentences set the stage (“The squirrels are too busy to notice, and the geese have already gone.”). Stringer continues to remind readers of the sounds (“Crows love yellow time. They fill still-leafy trees with their voices announcing its coming...”) and the smells (“wet mud and dry grass with a sprinkle of sugar”) of autumn and discusses the changing of the seasons (“Yellow time comes before white time. Every time.”). When the wind begins, everyone is ready: the trees, the children, the crows, and even the busy squirrels that use the fallen leaves for their lofty nests. The watercolor and acrylic illustrations, subtly reminiscent of Lois Lenski’s work, are full of movement and emotion. Stringer’s rendering of the autumn landscape and its diverse inhabitants, round faces lifted to the sky, remind readers of a moment in time. VERDICT This gorgeous picture book is a fine addition to seasonal and classroom collections, but it stands alone for its language and deft artwork. A lovely, evocative read-aloud. Stringer (Deer Dancer) offers up a poetic meditation on the transient wonders of autumn—aka “yellow time”—finding delight in everything from the smells of the season (“Like wet mud and dry grass/ with a sprinkle of sugar”) to animals not always considered to be lovely in and of themselves (“Black crows fill bare branches/ and raise their voices/ in praise of yellow time”). Rendered in acrylic and oil, Stringer’s paintings burst with bright swaths of sunflower yellow as trees bend and sway in the wind, giving up their leaves in golden swirls and curls as jacketed children revel in the turbulent weather, making crowns from fallen leaves and saving some to press between book pages as mementos of the season. It’s a joyful reminder to make the most of fall when it’s here. Up to age 8.
swoops of yellow leaves against black tree trunks and branches. One by one, children (and a dog) head outdoors and join up with one another, full of anticipation. Wearing sweaters and jackets, this diverse group of children together sniffs the air and watches the trees, waiting for the moment when the wind lifts and— “WHOOSH!”—the leaves begin to fly. The children are joined by others, who all dance and rejoice in the “yellow air.” There are no surprise twists here, just a gentle appreciation of the joys of using your senses to notice the changes outdoors as the seasons turn. From the book’s cover to the endpapers, yellow makes each picture glow, and curved lines repeat throughout the story to reinforce the beauty of the natural world. 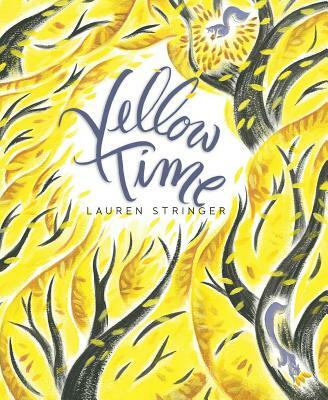 Yellow Time (Beach Lane /S&S) by Lauren Stringer is a joyfully illustrated, lyrical picture book about the fleeting days before the wind blows the fall leaves into a "symphony of yellow." It begins, "The squirrels are too busy to notice./ And the geese have already gone./ Other birds have left, too,/ but not the crows./ Crows love yellow time." Yellow Time is a celebration of autumnal leaves, captured in swirling watercolor and acrylic paintings of children and other busy creatures.